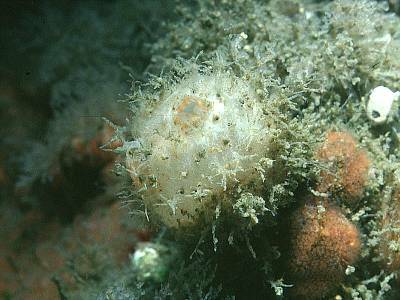 Description: This solitary ascidian is very inconspicuous and is usually overlooked. It is spherical in shape and covered with branched hairs which are very characteristic. It is brown in colour and usually covered with silt, which is trapped by the hairs. The siphons are short, and may be marked with red. Typically 10mm in diameter. Habitat: Usually in moderately sheltered silty sites, very inconspicuous. Distribution: A northern species, occurring around Scotland, throughout the Irish Sea, and north to the Arctic. Similar Species: No other species has the distinctive hairs on the test. Branched hairs of characteristic shape on test surface. Inconspicuous colour and rounded shape. Picton, B.E. & Morrow, C.C. (2016). Boltenia echinata (Linnaeus, 1767). [In] Encyclopedia of Marine Life of Britain and Ireland.